Hope you all enjoyed meeting the folks behind weelittlestitches yesterday! Clearly many of you are weelittlestitches fans too, just like me. 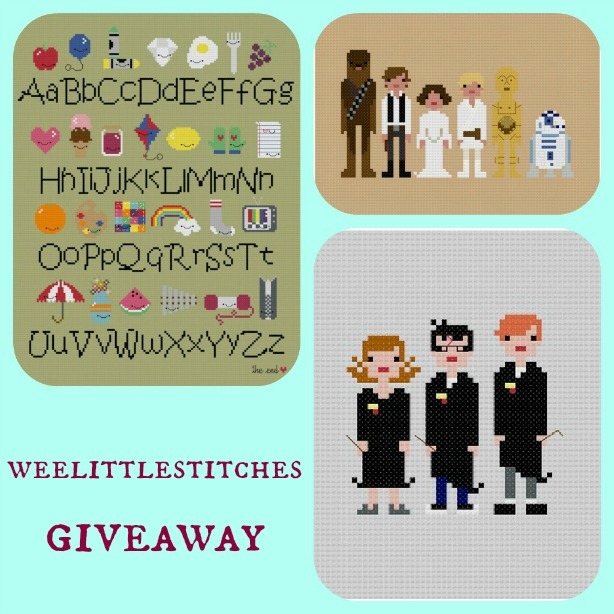 To have a chance of winning this wonderful set of patterns, please leave a comment on this post and let us know who (or what) you would like to see turned into a weelittlestitches pattern! This giveaway ends on Monday the 3rd of December, 12 AM Amsterdam time. 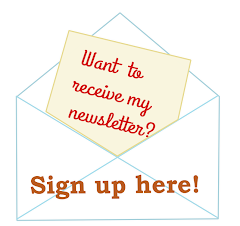 Remember to leave a trail so I can contact you or check back next week to see if you have won! I was so inpsired by your post yesterday that I have bought two patterns. I am going to give the first to my geeky 14 year old daughter who is constantly bored and watching the TV as an advent present. I chose the Big Bang Theory as a starter for her and I will be going to buy the Aida this afternoon. My pattern hasn't yet arrived so I can't buy the threads today. I think she'll like the pattern and make another for her friend. I'd like to see a James Bond inspired pattern with 007, Judi Dench's M and some villains like Odd Job, Jaws and Grace Jones' character and perhaps Honey Ryder as Bond girl? I'd like to see my favorite band, Fleetwood Mac, in stitches. Jack and Rose from Titanic, and Lizzy and Darcy from Pride and Prejudice would be awesome as well. Wow! What cool embroidery patterns. I may have to do The Big Bang Theory for my daughter. I looked through all of them and can't really think of another. I love Lord of the Rings, but that is already there. How about the characters from Pride and Prejudice. Jane Austen is always a good choice. Awesome giveaway. FYI my darling stitchers: Lizzy and Darcy from P&P are already charted and ready to go! :D I <3 Jane Austen... I'll be listing the pattern in the shop on Friday. I've bought quite a few of these patterns already and love every one. There's a handful going out in the mail soon as gifts for Christmas as well. As for other ideas, I would love to see some other classic fantasy movies done up like The Last Unicorn or The Dark Crystal... or for more recent, Battlestar Galatica. Oh, I love their patterns. I have, and really need to do (eventually) the Floss Daily pattern. I would love the following: Slimer from Ghostbusters; Characters from the movie Willow; Characters from Black Books and Spaced; and the word Smeg. Ooo, and maybe characters from Red Dwarf. I am pretty much obsessed with these patterns and have quite a collection already! I agree Never Ending Story would be awesome. Would love to see Community or Friends too. I'll pretty much just see what comes out next, I'm sure I will love it too! I've been turning the Harry Potter and Doctor Who characters into Christmas Tree ornaments, using plastic canvas - they work really well. :) I'd love to see The Incredibles as cross-stitch, or some of the Discworld characters. I love Wee Little Stitches! I've made quite a few of their patterns (and have a few more in the pipeline to work on)! I do think that some of the previously mentioned ones would be great - Community, Neverending Story, Ghostbusters! I can say that she always seems to have the patterns that I love... but ones that maybe she can consider are Shaun of the Dead cause that is funny.... or Sixteen Candles! Maybe Steel Magnolias!!!!!! There's a Shaun of the Dead pattern already - as well as Hot Fuzz and Paul too... we <3 Simon Pegg! Love Wee Little Stitches! I'd love to see Downton Abbey, Game of Thrones, Walking Dead, Firefly (was there already a Firefly one? ),Neil DeGrasse Tyson, and the ultimate: The Four Horsemen - Dawkins, Hitchens, Harris, Dennet. There is a Firefly one, yay! I love these patterns! I'm currently working on The Big Bang Theory and have made about seven others for Christmas presents. I'd love to see the characters from the Monkey Island video games. Also, Indiana Jones. Oh, and Jaws. And Sesame Street. Arrested Development would be cool, too! Anne Rice's main vampires? Or even the witches? The Charmed sisters (all four)? Would love to see Jaws, Anne of Green Gables, Sherlock (BBC), Jem & the Holograms. I love Wee Little Stitches. Just finished the Big Bang one. I would love to see Mario Bros: Princess Peach and the characters. Also, the Soft Kitty song from Big Bang theory (maybe with a cat). Aww, soft kitty song would be perfect! I love that site. I've had a go at a few already! I'd love to see an individual Spiderman pattern, Scott Pilgrim, Muppets Christmas Carol and I definitely echo other people's comments about Pride and Prejudice. I'd love to win (I don't yet have these patterns, but I've been eyeing them)! I would like to see Sixteen Candles as Pixel People. Also, the cast of The Walking Dead, so I could stitch it for my husband. Another good one would be the cast of American Horror Story, again, for my husband...those shows are WAY to scary for me! Ooooo...I see a comment above me mentions the cast of Arrested Development - that would be great, too! Basically any 80's movie with Molly Ringwald should be a pattern. Let me add some love for Neverending Story, Dark Crystal, Game of Thrones, and THE MUPPETS! Oh, these patterns are so cute ~ love the Dr. Who one the best. I'd love to see some animals ~ cats and dogs with people. That would be cute! I am with Kiba - Community!!!!! Please, please, please! Love these patterns so much! Can't believe I didn't think of Seinfeld. That would be great! I have made quite a few of their patterns already. I love them. I would like to see a Twilight pattern, the flintstones, bobs burgers and I'm sure more will come to me. I vote for Neverending Story as well! LOVE these patterns! I would love to see the Sherlock cast or Loki! Love love love weelittlesitches, I have the Dr.Who team on placemats which are now too loved to be used so hang on the wall, I've done The Princess Bride group as a happy engagement card for good friends, and I'm planning some Labyrinth Christmas goodies (although I'm running out of time! As for new patterns....hmmm.....TWIN PEAKS!!!!! I would love an Agent Cooper with a hot cup of Joe! YES! Twin Peaks would be awesome! My husband would FLIP for a Twin Peaks one, but I'd probably be scared to do if it Bob was involved! I would love to see a Being Human or Supernatural cross-stitch. I'm so in love with weelittlestitches, their interests are so close to mine and they make awesome patterns. Thank you for the giveaway! Well, you've pretty epically captured most of my loves in cross stitch. Maybe some Muppet love. And I like the Avenger idea. I love the designs on weelittlestiches! Honestly, I enjoy all the patterns they already have - I love the superhero alphabet and I'd like to see the Avengers on their own! I'd also love to see a Sherlock pattern! I adore Wee Little Stitches. All my Christmas gifts are home made this year. I would love to see The Christmas Story with Ralphie in his pink bunny costume, Rocky Horror Picture Show, and more Harry Potter foes. I want to stitch Dolores Umbridge and Bellatrix La Strange. I would love to see a Stargate SG-1 or Stargate Atlantis pattern! Thanks for the opportunity to win and thanks for showcasing Weelittlestitches! I LOVE Wee little stitches. The patterns are the best & make the best gifts ever. I would just die if they made a Sandman cross stitch pattern. I'd love to see Dream, Death, Destiny & the others. I would also like The Neverending Story. It's one of my fav movies. I think the characters from A Series of Unfortunate Events would be great too! Oh yes, the Endless, please! Delirium/Delight would be so fun! Okay, just a couple more ... Top Gear UK (maybe a long shot! ), Mythbusters, Back to the Future, Blackadder, Fish Called Wanda! Yes ! Back to the future would be great !!! I have purchased many Wee Little Stitches patterns -- LOVE THEM!! I'm an 80's preteen, so I Had to Have the Breakfast Club pattern. and with my name, 'Daphne', the Scooby Gang was a Must Have as well. I recently ordered 2 custom patterns -- family of 5 and bride & groom. So excited to stitch and gift those!! Can hardly wait for the reactions!!! I definitely plan to purchase/order more patterns from Wee Little Stitches!!! The Maxx with Julie Winters, Mr. Gone and an iz. I love that I'm not alone in my nerdiness! I would love to see the Lord of the Rings characters or Peter Rabbit (those are so different!) Great giveaway! Oh duh - of course you already have Lord of the Rings. How about the cast of the Wire - could you imagine doing Omar's scar in tiny stitches? Lits of great patterns! So hapoy to have found you. You have. Great variety of patterns and sounds like you have lots more in the works. For us "older" folks, how about Bonanza, Get Smart and Little House on the Praire. Thank you and Wee Little Stitches for an awesome giveaway and a chance to win. I would love to see an Army of Darkness pattern!!!! Love wee little stitches and would love to see Buckaroo Banzai! I would love to see a wee little Royal Family. Or a wee little Royle family would be just as good! I would like to see indiana jones, alice in wonderland, die hard (and his wonderful catchprase! ), stargate sg-1 and maybe monsters inc as i'm a sucker for that film! I love wee little stitches! I still haven't bought any patterns, but as soon as I can see some time opening up in my life again, I will! They appear to be perfect for an amateur stitcher who's been out of the loop for a bit. Ya know what would make nerdy heart even gladder than it already is with Star Wars and Dr. Who? A Stargate-SG1 pattern. Yup... life is already awesome with all the patterns you have, and Stargate-SG1 would make it perfect! I am working on their amazing Monty Python piece, but I'd love to see a few more of the characters - Dennis, the man turned into a newt but got better, the 'Bring out your dead' man+not yet dead man, God and more! And more, but I have to stop sometime!! I would love to see something Christmas-y. Maybe a nativity scene? Thanks so much! I just got my first patterns last week. All I need to do is find the rest of the colors and I'll get stitching! I'd love to see the Hobbit and Narnia characters. I also love the suggestion of the Muppets and some Disney type princess would be nice for little girls. What about Eureka or Warehouse 13? I'm amazed there hasn't been a Twilight yet, although they're probably not destinctive enough! I love all of the patterns I've seen you do, and would love to see more! I would love to see the Endless from the Sandman series. I would also like to see something from The Neverending Story, and possibly something from A Series of Unfortunate Events. so cute! I'd love to see the Grinch characters (from the cartoon version). I would massively heart some Neil Gaiman Sandman characters to stitch. But then someone mentioned Jem and the Holograms. And 8 year old me let out a mighty "Squee!". Now I'm torn. I love love LOVE WLS- they have changed my life! OK, slight exaggeration there but they did help me get into cross stitch when I was bored convalescing after surgery earlier this year. Since then it's been stitchstitchstitch! I would love to see a 'Farscape' pattern- plenty of weird, multi coloured aliens to get my teeth, I mean needle in to!! And a huge game of thrones pattern!!! Or broken down by house! Eeee!!!!!! I would love to win. I think an idea that I would like, would be similar to the stick figured on the backs of cars. Patterns that you could adjust to fit your family (people with features you could mix and match). I love love love weelittlestitches. The best patterns are the ones that are instantly recognisable (at least to those of us on the geeky side of normal). In this spirit, I would love to see a BACK TO THE FUTURE pattern, with Marty in his red gilet, the doc with his mad hair, and of course the DeLorean in profile, in all its flux-capacitor-related glory. Love these guys - I have the eleven Doctors hanging on my wall and it is a thing of beauty. I am holding out for Battlestar Galactica. I think Ive bought like 10 patterns. Wee Little Stitches is probably my favorite etsy store!! I would love to see family guy or american dad. They are pretty popular too. Thanks for hosting a fabulous giveaway! I would like to see a wee little stitches of Mayhem from the GEICO commercials (I LOVE THAT GUY)! How about the characters from Black Books or Mr Bean, his teddy & mini? Mmm, what about Edward Scissorhands, Captain Jack Sparrow & Willy Wonka - all Johnny Depp? Or the characters from Dr Who - the Daleks, the Cyberman, the Ood & that character that was a fighter with no neck - can never remember his name! Agreed black books for the win! What a hard challange! Though i agree with Rie Black Books all the way and maybe some Studio Ghibli or Sherlock (the good BBC series). Alice in Wonderland from the game Alice: Madness Returns by EA. I am a nit for AiW, especially the original vintage or creepy interpretations of it. This shop's patterns have been on my wish list for months... I plan on indulging myself right after the holidays! Thanks for the chance! I already own 2 of the charts in the giveaway and can't wait to get stitching! I have recently stitched a couple of Wee Little Stitches charts: Futurama and Death before decaf. Loved stitching them. I would love to see the Red Dwarf crew as a pixel people chart, but I believe it might be on the way. I would love to see Dexter, Moulin Rouge, The Walking Dead, Sherlock or Downton Abbey! What i would like to see is Kiss,Stargate,Battlestar Gallactica(the first),Bonaza,Rifleman,BIG VALLEY,the Three Stooges with Curly,Riddick with Jack,and a '72 green Chevy Nova and a red and white 57 Thunderbird...i'd be interested in stitching any and all of these. I heartily agree with those who requested Community. Pulp Fiction would be fun, too. And I love the Wes Anderson idea. I discovered weelittlestitches when they did the blog entry about the iPhone cover . . . and have been in love ever since. I've got a couple of patterns, but a girl can never have too many patterns. How about "Gone with the Wind" or "A Christmas Story" or "Fraser" or "Seinfield" or "Toy Story"? Thank you for directing us to the Futurama freebie above. It has now been downloaded and added to my collection. What about a House pattern with 13, Chase, Wilson etc. 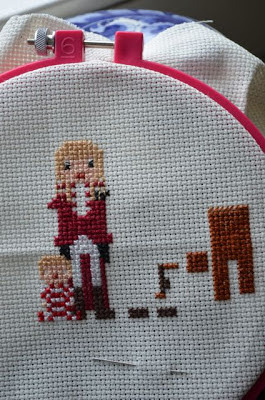 I would love to see a Hunger Games wee little cross stitch! I'd love to see the Simpsons, and the characters from Black Adder. Toy Story, definitely! Those are great for the kids! How I Met Your Mother would be great as well.